This is a fairly common theme for me – to share progress photos of paintings. I like people to see that a painting does not just come about in a few sittings, but often can undergo a complete transformation from its beginnings. I am guilty of getting attached to areas of paintings and not wanting to paint over them. But sometimes you just have to let that all go in the pursuit of something more. For it is only through the layering of the paint that I believe you can tell a full story. So here is the story of this one. I brought this piece in to art class at a stage where I thought it was close to finishing. And by becoming less attached and less precious with it I was able to explore completely new territory. I referenced the great Idris Murphy for this piece, both in my colour choice and in the banding of the landscape, as is typical of his compositions. Early stages. Background and shapes on top of it. Early stages. Lots of loose brushwork and more colours. Introducing more colour and a few more shapes which makes it almost a bit too busy. I attempt to put in a blue "sky" but feel it doesn't work and so I take it out again. I take out the sky add in some greenery. Increase the earthy tones. Now I flip it upside down which is an essential part of my process! So I flip it upside down again. And back up again and change that big contrasting shape. 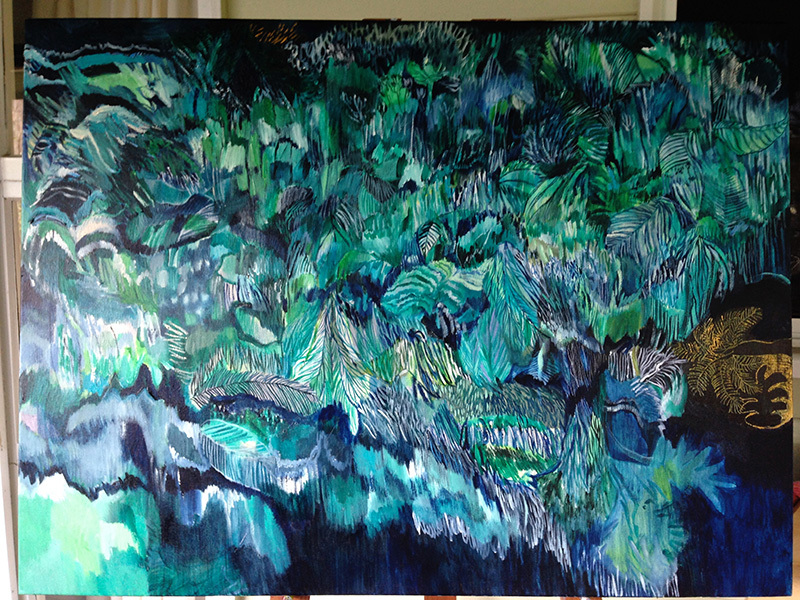 I start to bring in some dappled elements from the view of the trees from my studio. I put in more shapes. I get here. And I stop. It is ambiguous enough to be interesting yet still definitely a landscape. It represents the red earth of the land here in Newybar and the space I have around me in my new home. I have called it For Always because after moving 25 times I will not move again. This is my home. I am continually updating my print range to try and provide a cross section of work that can bring the right colour combination and feeling into your living space. Original art is a big investment to make which is why choosing a high quality print created on archival paper with archival inks is often a great and affordable option. Here a some of the latest additions to the print range which you can buy online here. Free shipping Australia wide. Minted 56 x 56cm. Shop here. Blossom 30x30cm, 56x56cm, 92x92cm. Shop here. Green Line 30x30cm. Shop here. Island Hopper 30x30cm, 56x64cm. Shop here. Reconnaisance 30x30cm, 56x72cm. Shop here. Sometimes you'll paint something and you think you are okay with it. You kinda like it. It's good. You've spent a lot of time on it. So much paint, so many layers. You sit with it a while. A few weeks even. And then you start to fall out of like with it until you find it actually starts to irritate and aggravate you the more you look at it. Or you nit pick it to death and find all its faults and realise.... its time for a rebirth! And oftentimes this process of the rebirth will bring about something totally unique and opposite to what went before. Well, this is the case with this painting anyway... And the painting that went before adds depth, dimension and information to the piece. It only ever adds I believe. This is my starting image: a fully realised painting. That I didn't like. I'm probably missing a progress shot between the first image and this one. I am guessing its cos I just went ape with the paint to try and cover over the reds as quickly as possible before realising I hadn't taken a photo! And then we get a pop of pink and rust from out of nowhere! The finished piece. Plenty of texture (lots of sanding back was done). It was certainly a process. But worth it I feel! If you love this painting you can buy the print on my online store here. Quite often I will complete a work and then after sitting it with a while decide it is totally not up to scratch and I will cover it over completely until something else emerges. This particular piece "Life is an Adventure" was voted the "most popular" piece at my second solo show in 2014. 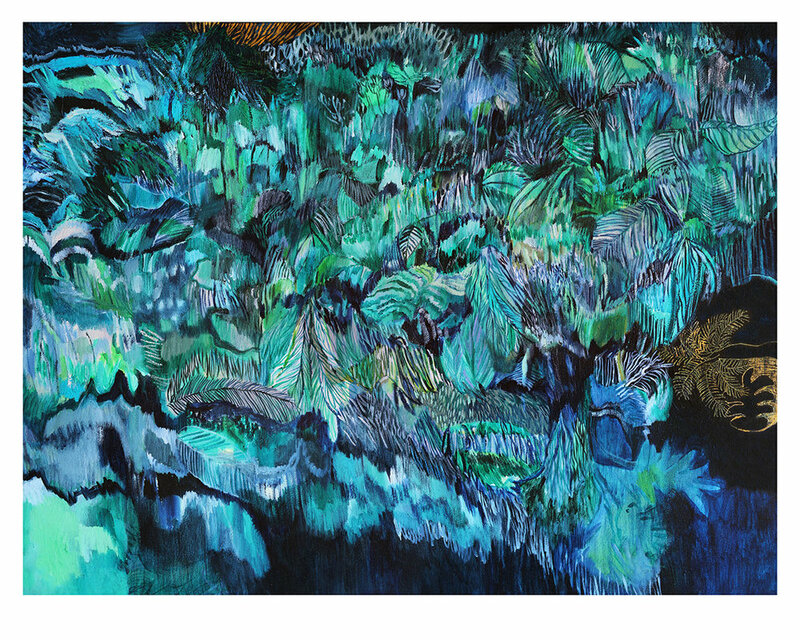 The jungle and green depict the landscape and different avenues, opportunities, hardships and twists and turns that life can bring us. The gold leaves represent the hidden treasures that are planted along the way, which we uncover just at the right moment, to send us a message and give us hope. The starting image. A painting which I had previously thought was complete. It wasnt! 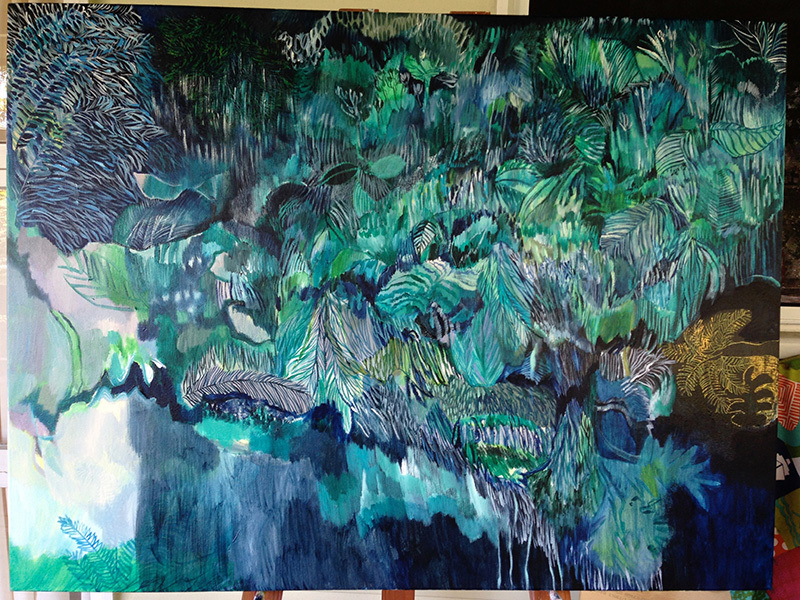 I flip it around yet again and keep expanding the "jungle"
And here it is pretty much done! This has been a much loved piece and is available as a print in a number of sizes from my website here. 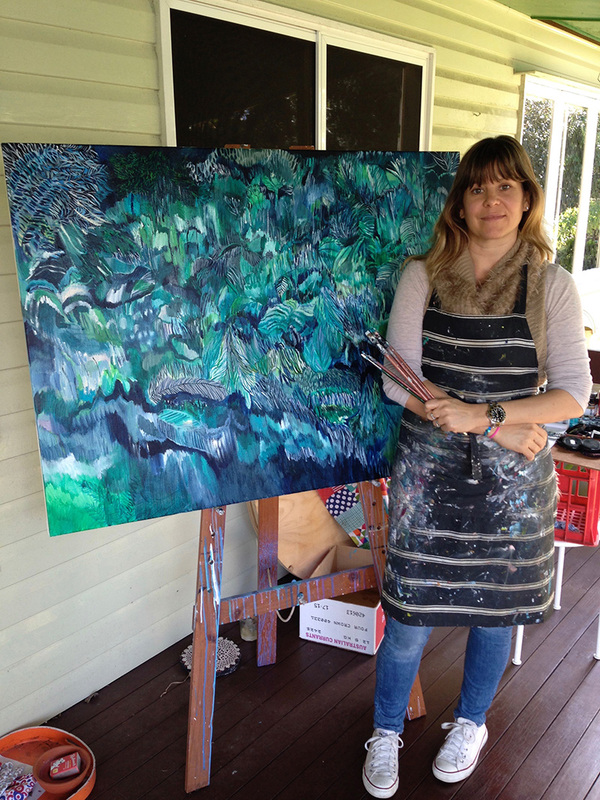 I was approached by a lovely Sydney lady and her interior designer in Winter this year to create a custom artwork for an investment property in Byron Bay. 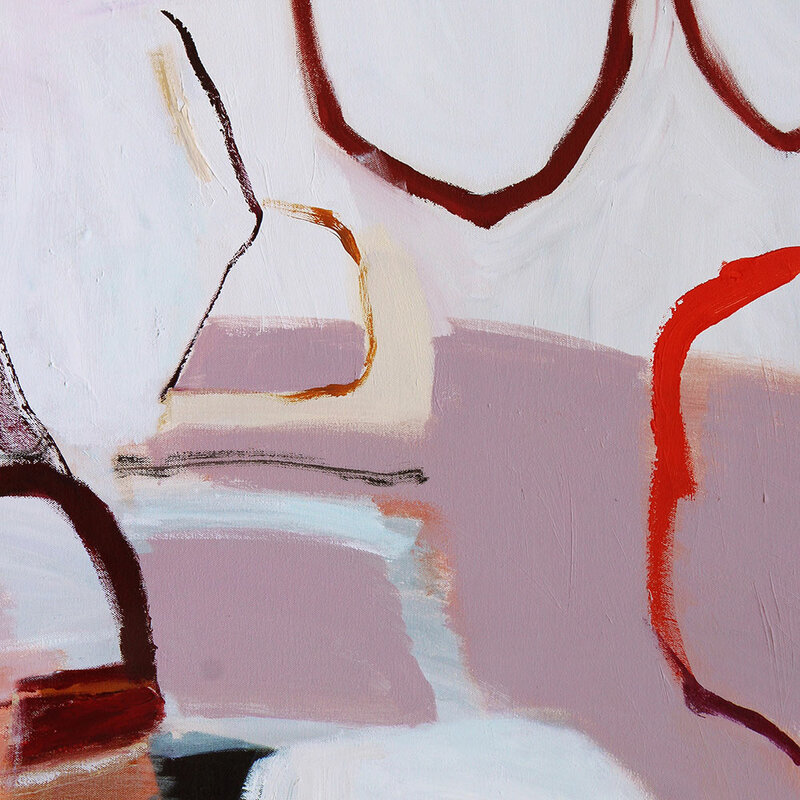 The interior designer sent me a mood board of fabrics, colour swatches and samples of paintings the client liked and then it was up to me to realise the vision of an abstract painting that employed dirty reds and a spot of antique green. I have to say this one was a real challenge at times and it has taken a while to get there, but I am finally very happy with it. Here is a photo diary of the stages, good and bad, of this piece, which I have just realised does not yet have a name! And more colour. Funny, when I look at this now I wish I had kept this version as a painting of its own.. I love the freedom of it! This is when I really started to hate where this was going! After a chat we decide to add in some geometric elements, based on patterns from the client's PNG background. I finally start to like it! And there it is... the almost completed product... hopefully its not far off! As a working mum, holidays can be hard! Not because I'm working extra hard, but more that I'm not, if that makes any sense. I start to fret that I am not getting enough done in the studio and shop and that I am falling behind in my painting. And then I just have to stop andd remind myself that it is okay to have a holiday too sometimes and to stop being so hard on myself. My kids love having me around and if I can spread out my stuff on the dining table – an array of paper and glue then that's really not such a bad thing! Here are a few pieces I put together last week. I do love my collage! My 6 week course at the Byron School of Art has now concluded but I enjoyed the experience so much I am thinking about going to study more intensely at the Byron School of Art for the next couple of years. I have loved being pushed out of my comfort zone and being in the company of other artists and I think if I can juggle it all it will be excellent for my development as an artist. I have realised how passionate I am about the art of abstraction. It is a very challenging form of art – to create something beautiful and interesting out of nothing but shape and colour is incredibly hard. And I find that challenge so enticing... Here are some images from the work from this last session. This was a super quick one on mat board that I literally did in 5 minutes as the day was drawing to an end. Paint, collage and ink. Inspired by the work of Robert Rauschenberg (who I had not heard of, but am now a huge fan of) this one was also pulled together very quickly. Paint, collage, ink, graphite on board. 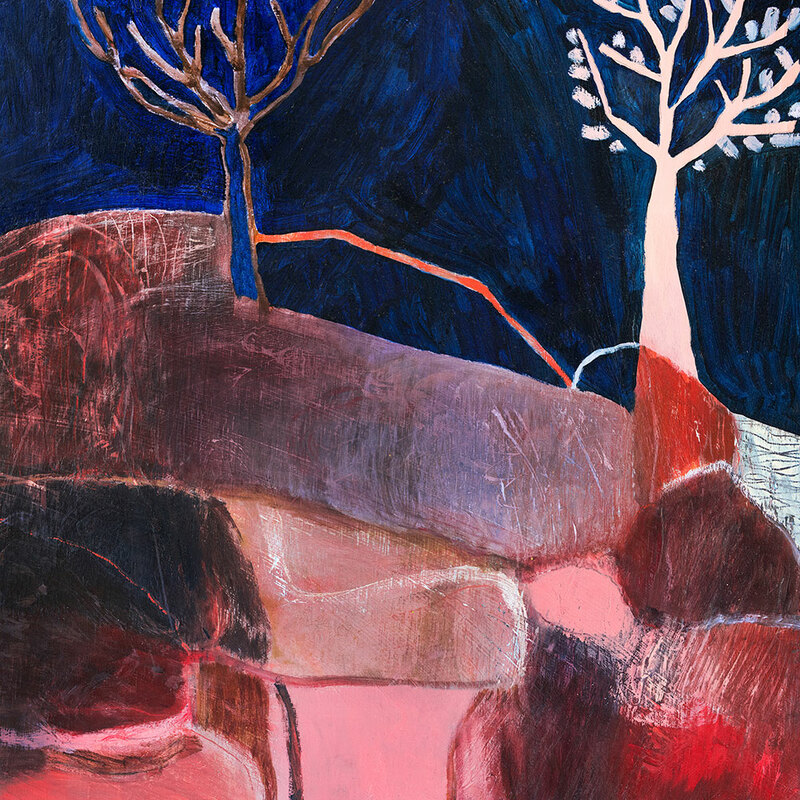 And now for Idris Murphy, a contemporary landscape painter from Australia, who I also had not heard of... Well, wow, gob smacked at his work. Just so captivating.. I cannot stop looking at them! Such brilliant use of colour and minimalism. I find them all divine. OH my god – seriously? This is just sublime.. I am in love! A lot of my paintings seem to translate well onto fabric and I have been learning and practising how to create repeat patterns for a little while now (thank you YouTube). It certainly helps having my graphic design background that enables me to work in Photoshop and manipulate my own images to create textiles designs. These are my first 2 tablecloths and I have also produced a small range of napkins. 4 per set, each napkin per set is from a different part of the same painting. These first images showcase the Life is an Adventure tablecloth, based on the painting by the same name. I couldn't wait to return to class this Thursday – it seemed nor could a few others! We all so eagerly wanted those 4,5 hours of uninterrupted time to continue on with what we had started the week before – working again using random objects and shapes to create abstracted forms. We worked on a variety of surfaces, from good artist paper to brown textile pattern making paper and board. I stuck with paper, as it has been a long time since i have truly played with making shapes on paper, and I was loving it too much to move to another base material! Here are some images from lesson 2. Lots of rusted old objects on a table runner of white paper, and a delightful group of 7 ladies. Piles of books on Abstraction and little mounds of charcoal and art supplies in front of us all. And Michael. The recipe for a perfect morning! And completely perfect it was. Between the odd cup of tea and silent wilful drawing and mark-making we all found ourselves in our little zones, loving every minute of the extravagant solitude and unrushed time. Nowhere to be, no one to take care or domestic jobs to do.. just hours of rich, full moments of presence and intent. So fulfilling and meaningful. I love the drama of the dark walls in this room. My work "Knowing the Uncertain" hangs to the left of the large Michael Bond piece to the right "A Time to Reflect"
Below are some other pieces that contain elements of South Africa, both flora and fauna. This first one I painted in 2012 and it sold at a local art show. It captures a colourful array of proteas with the vibrant Springbok up close. This one titled "Beautiful Dilemma" I painted in 2013, 10 years after immigrating to Australia. Struggling with homesickness this piece reflects my inner struggle to leave my motherland to live in another country. This one, painted in 2012, titled "Home" was one of the first paintings I sold. It is an abstracted scene of proteas, utlising rich golds and oranges and was inspired by my many sketches of proteas in my drawing journals. With a proud zebra taking central stage this piece was one of a few mixed media artworks I created back in 2013. Lots of detail and texture and sold at a kindy art fundraiser in Brisbane. Bright and energetic, with staccatos of popping colour this painting wants me to get up and dance around the room. I had so much fun creating it, it had to have a light hearted title... Buy this print here. Conjuring up the chaotic feel of a Moroccan or Indian spice market with the hustle of people, food, rugs and colour, this one to me is a rich and lively Grand Bazaar. The original sold through Fenton & Fenton in Melbourne, but you can buy the print here at a size of 50 x 59cm plus a 3cm paper surround for framing purposes. Signed by myself. I mostly never know what I am going to paint, as was the case with this one, but as I finished it, there was only one name for it. With the blues of the Greek oceans and the whites of the iconic buildings, the gold of the sun and the loose relaxed application of the paint, this took me back to the '90s when I was a young carefree traveller visiting this great fun island of Mykonos. Buy this print here. Everyone sees something different in a painting. For me this is a scene of drinking vessels, cups, pots and vases spread out on a picnic rug, the fruits of an industrious day behind the potting wheel. Buy this print here. I was starting to struggle with this piece. It started out really pale and pastel and it was all rather tight and contrived and there wasn't much about it I was liking. 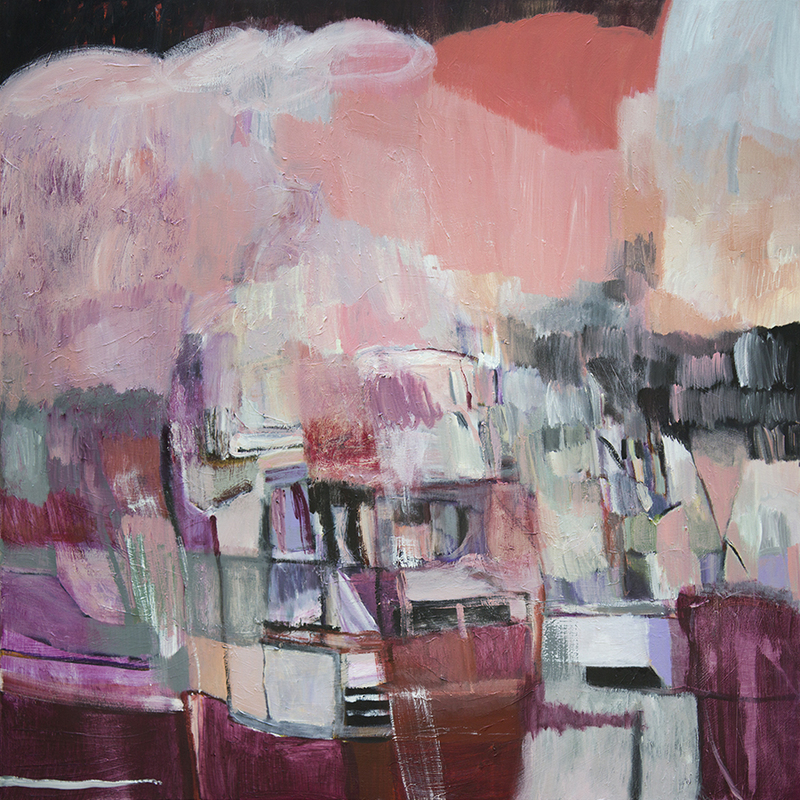 It needed an injection of colour and so out came the Napthol Crimson, the Rose Pink and the Magentas and as I moved these colours across the canvas, it started to come alive, it started to feel comfortable and easy and the final piece came together very intuitively. The simple suggestion of a crown shape dictated the name of the painting for me. For in the studio with my brushes and canvas I am in my castle, I am the king of my creativity. Buy this print here. For Mother's Day this year I gifted one of my art cushions in a giveaway I ran on Instagram. I thought it would be a lovely way to share the love, as my own mum is on the other side of the world...The winner (chosen at random) was Sonya Hayes from Yamba and she picked this pink parrot cushion as her choice out of 4 designs. Below this image are some shots I took of some of my other cushions at the Art House in Newrybar – a gorgeous and quaint accommodation venue filled with a great eclectic mix of local art. At the start of the year I wrote about the importance the role of vision boards can have in your personal and business life. For a while now I have fantasised about being a Fenton & Fenton artist but never really thought it would be a reality. On my vision board for 2016 I have 4 big goals, the first being "Get into Fenton & Fenton". And then about 5 weeks ago I got the email from them asking me if I would be interested in working with them! I mean, can you believe it? The power of desire and intention.... just incredible. Needless to say I am one incredibly happy artist right now! The image above shows one of my paintings beautifully styled in a room along with work and items by Lisa la Pointe, Michael Bond, Amanda Dadziedzic, Elise (Cakebread), Mr Fenton Rugs and Mahal coffee table. About 18 months or so ago a lady by the name of Alison contacted me via Facebook after watching myself and Todd on the Grand Designs episode of Series 5 in 2014. She expressed an interest in commissioning me to paint 2 pieces for her and we liaised on and off for a fair period while she was getting clear on what she wanted. 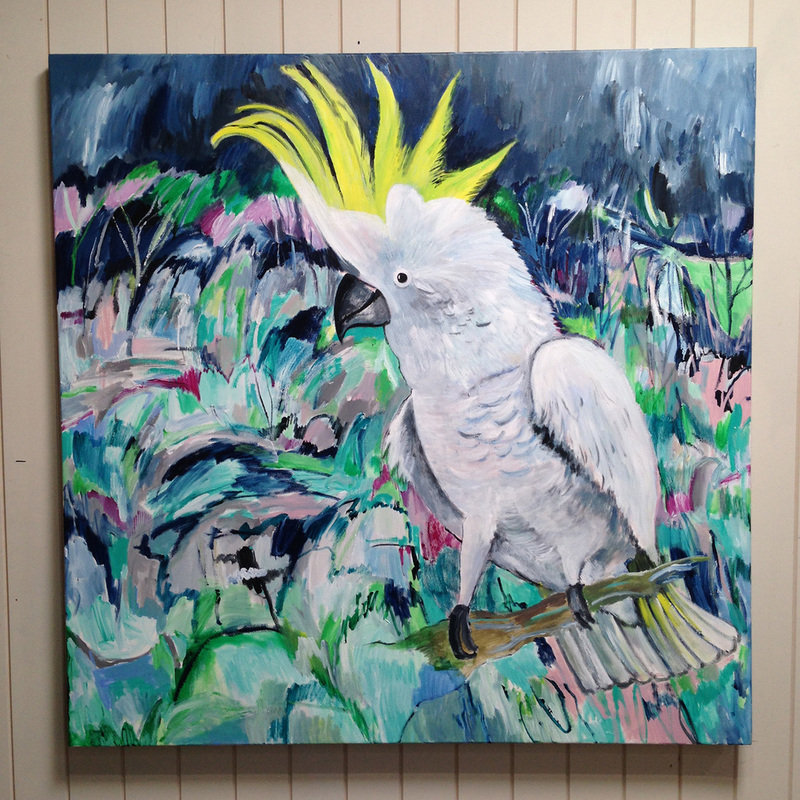 Towards the end of 2015 she decided on 2 cockatoo themed paintings, one of 3 black ones and one of one white one. These gorgeous creatures have a special place in the hearts of Alison and her husband which is why they chose them as the feature for their 2 large paintings. Fast forward a few months and her 2 pieces are now complete and ready for framing and freighting to her home in Albury, NSW. Alison, it has been an absolute pleasure creating these cockatiel portraits for you and I hope they bring many years of joy and inspiration into your beautiful home. cocky 1 with more detail and speckling! Whoops, I got a bit carried away before i took my first photo! So there you have it! I can't wait to see these 2 hung in their new home! I have just unpacked my last box and its starting to feel like home :) Moving is such a big job and this one was a doozy. I unpacked EVERYTHING – stuff that has been in storage or in a box for so long I didn't know what was in it. Todd and I filled a skip with stuff before we moved too. Boy, was that refreshing! Now I just need to turf a few more clothes.. I do struggle with that one though. So here we are on top of the hill in Possum Creek. We have been in NSW almost a month now and have to say it totally feels like home. We LOVE IT! The shop has been hugely busy with Christmas and holiday makers to the region. Byron Bay is swarming with people, to the point where you'd rather just avoid the place altogether! I have managed to paint a few new paintings over the last couple of months, and the studio is working out well despite having to paint in front of customers which I wasn't too sure about. This one is titled 'Now the fear has gone'. I painted this piece a couple months in to opening the shop. It is symbolic of me letting go of the fear of not being good enough – an incredibly common fear that many of us suffer from in our lives. This one is 'Moonwalker', a bit of a crazy trip beyond my reality. A complete shift in colour and a return to my yellows of my early painting days... I love this one! It has been a huge honour to work with Kerry from Bondi Bather Australia on this incredible collection of swimwear and activewear. Kerry has licensed the use of one of my paintings "I carry my treasures with me" to produce this impressive range which will be stocked in her Australian stores as well as overseas to other retail outlets. The collection will be arriving in my store at the Newrybar Merchants either today or tomorrow. I can't wait!